Another year has begins, and why not start planning also based on the phases of lunar calendar for January 2019? 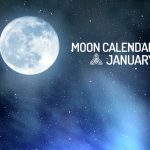 Check below the lunar calendar of January 2019 and see what are the recommendations to have a balanced month and take the best actions. As early as January 5th, as you can see, the New Moon will begin the phases of the lunar calendar for January in 2019. During this cycle, the Moon will be for the first time in the year between the Sun and Earth, becoming virtually invisible in the sky . Another year begins, and with it a lunar phase that leads to reflections, planning, and a greater organization to initiate plans and projects that you have in mind. On the 14th of this month, the Crescent Moon shows itself in the sky. And with it, the action plans must be put into practice, since now you are energized by the positivity of the New Moon. In addition to the plans, many things must happen at an accelerated pace during this time. So if you want to let your hair grow in 2019, for example, you should bet on a nice cut to renew the hair and allow it to grow faster. The arrival of the Full Moon in January 2019 also marks two important events: a super moon and the phenomenon of Blood Moon. That is, at the same time that the Full Moon will be closer to the Earth, it will also be under the action of a total lunar eclipse, making it take on a red color like blood. If something was left open or unresolved in 2018, now is the time to put an end to those situations – especially those that are letting you down. Reflect on your attitudes, analyze the events, and prepare for a new cycle. With the presence of a powerful Full Moon as early as the first month of the year, the stars point to the emergence of an extended period of action from the lunar eclipse. This energy should last for at least 6 months, so consider strongly the possibility of building your future on solid foundations, and work for success. January alone refers to transformations, the realization of new plans and changes of habits and attitudes – standard reinforced even more by the New Moon as soon as the fifth day. However, rare lunar conditions, such as the Blood Moon, point to complementary behaviors. Maybe now is the right time for you to abandon certain things, memories or even people of the past. It’s time to get over it, or just forget about what it takes.